Do you recognize that feeling when you look in the mirror and see that spot next to your lip again? Yes, unfortunately the cold sore is back and causes that itchy and burning feeling again. But don’t worry there are remedies to fight this infection. What are the causes and symptoms of cold sores? 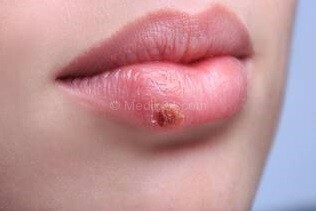 Cold sores are caused by the herpes simplex virus. The herpes simplex virus is a contagious virus that will forever remain in your body, once you have had it. The inflamed spot near or on the lip may itch and burn on the first days, but later it will dry up and scab over. Be careful not to touch or scratch the spot to prevent infecting other people and since this virus is passed through skin-to-skin contact, kissing others is discouraged. How can cold sores be treated? Cold sore can be cured by creams, ointments and pills. These medicines will help ease the pain and the uncomfortable symptoms.